Theaters of Fiction presents work by seven contemporary artists who have utilized a variety of means and mediums to explore themes of illusion, escapism, and artificiality through the physical space of the theater and its accoutrements. Rather than depicting actors or audience members, these artists look outside the performance itself to the space in which it unfolds. Foregrounding the absences present in spaces where fictions are staged, these works explore the enchantment and fallacy of fantasy and reveal the constructs and hierarchies of culture and of the fabrications with which we entertain ourselves. 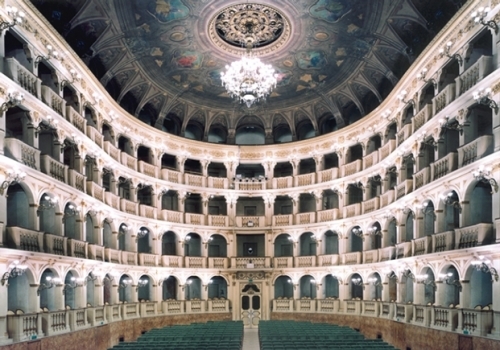 Some of the works address the theater and opera’s historic associations with power, privilege, and wealth. Others represent sites of more democratic and popular entertainment to examine themes of escapism. All, however, engage in dialogue around image creation and art production in a highly self-reflexive manner.